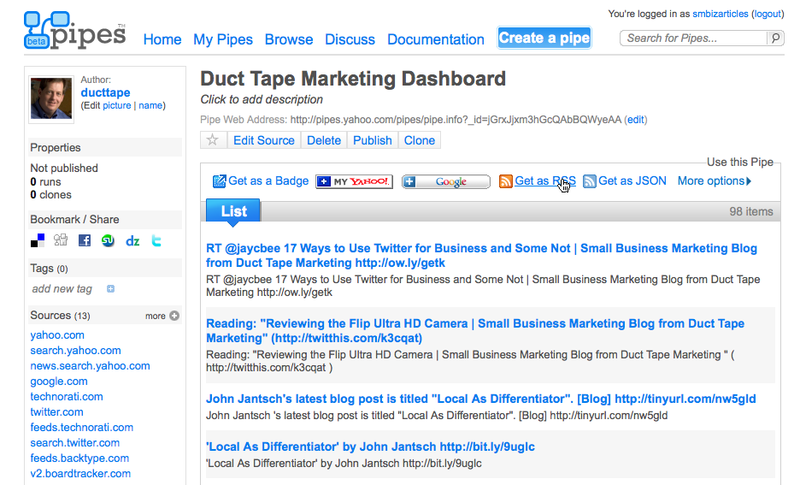 Tag Archives for " Yahoo Pipe "
Monitoring Social Media Metrics – Nice “how to” article that uses Google Docs to create SM spreadsheet. I know I’ve run across more than one frustrated marketer that was charged by the boss with showing some metric on the effectiveness of Social Media. Keyword CSV file on Yahoo Pipes Demo – this video shows you how to take a series of keywords from a CSV file and uses Yahoo Pipes to run each keyword through various searches. GraphJam – Graphs are often used to illustrate business information, both good and bad – this very funny site uses the graph to illustrate some very interesting statistics like “the amount of ink in my printer” – laughing is good medicine! Yahoo Pipes is a powerful composition tool to aggregate, manipulate, and mashup content from around the web. Frankly, it has been around for a couple of years now and while it’s advanced a bit, I don’t think it has ever really caught on in a big way. The interface is a little funky and takes some getting use to, but once you do, it’s a pretty cool tool. Pipes can do some very complex things, but what I think it does better than most other options is allow you to aggregate, sort and filter many RSS feeds into one. So, you might be asking at this moment, why would I want to do that.